Whether you hail from Maryland, Virginia, or somewhere else in the Mid-Atlantic region, you need to pay close attention to tree care. The right care and maintenance will help ensure that your tree lasts for decades, perhaps longer than your own life. However, failure to care for your trees can result in catastrophic repercussions. Whether you’re planting a small tree species like a dogwood or a holly, or a larger variety like a maple or white oak (or any of the other numerous tree species that thrive in this region), there are some specific considerations to be made. For all trees, the first three years are critical for care and maintenance, beginning with planting. Ensure that you choose the right location in your yard for the tree, and the right species for the location (eventual size, sunlight requirements, etc.). You also need to plant it correctly, with the trunk upright, and the root flare (the point at which the roots and trunk meet) above the level of the surrounding soil. Beyond that, you’ll need to worry about feeding and watering your tree, protecting its delicate roots, and pruning it for form and function. Watering – Water is vital for trees, and larger trees can transport hundreds of gallons of water per day from the roots to the crown. During the first three years, it’s important to water your tree well at least once per week if it hasn’t rained. After the three-year mark, you can relax a little bit, but make sure you provide ample water during any dry spells. 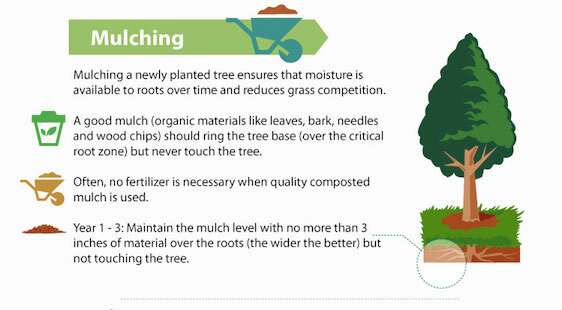 Feeding – Feeding your tree consists of fertilizing your soil. Have a soil test performed to determine exactly what nutrients your soil is lacking, and then tailor your fertilization efforts to that. If possible, avoid synthetic fertilizers, and instead, opt for rich, organic mulch around the base of your tree. Organic material will decompose over time, providing more nutrients for your tree. Mulch – Keep the mulch about two to three inches from the trunk of your tree, and layer it up to two to three inches thick. Check mulch periodically to see if it needs to be replenished. Avoid synthetic mulch options (shredded rubber, for instance), and use organic mulch like shredded bark or leaves instead. Pruning – Pruning is an important part of tree care, but it must be done correctly. In the first three years, only prune critical branches, those that are dead or dying. After this point, you can begin trimming the tree to fit your sense of aesthetics. Prune just outside of the cambium layer to ensure the wound will properly close over. If you cut into the cambium layer or leave a stub, you may be causing more problems than you’re solving. Regular Health Inspections – Diseases and other problems can appear quickly. It’s important to monitor your tree’s health regularly. While only an expert can accurately determine the cause of any underlying health problems, there are several things you can do on your own. Monitor the annual growth of your tree and if there is a dramatic reduction one year, this can be a sign of an underlying problem. You should also watch for patchy crowns or discolored leaves, as these can also indicate health problems. Finally, make sure you avoid the most common mistakes made with tree care. Never top your tree, and avoid poor pruning. Mechanical damage to the trunk (gashes, scrapes, etc.) can also lead to disease and death. Under watering, particularly in the first three years, is a critical mistake that can leave your tree weak and stunted. With the right care and maintenance, you can grow strong, healthy trees. To consult with an experienced arborist, contact Growing Earth Tree Care today, (703) 818-8228.